Behind Green Eyes: What's in My Handbag - The Organized Edition! This is the organized edition of what's in my bag. Not that I've ever done a disorganized version, but anyway. First off, this is my bag. Top Row - Wallet (Penneys again), Prescription Sunglasses, MP3 player, and leather bike gloves (sure why not). Bottom Row - hair bands, hand cream, Prevalin allergy spray, Nivea lip butter, Lacoste & FM perfumes, MUA lipstick (shade: Bare), and 3 Apocalips. Sure deodorant, 5 pens (?! ), a mini torch, Boots card, Weightwatchers calculator (not following it at the moment but it's always handy to have), little card with an Irish Blessing on it (no, I don't know why), and two notebooks - Animal from the Muppets and my recipe/blogging/shopping list/address book. And a pink pen. While it's not a massive amount of stuff compared to some of the rubbish that could be in there, I still have a hard time finding stuff sometimes. This little beauty is a handbag organizer, and it set me back approximately two of my finest Euros on eBay (link here). I ordered on June 21st and received it less than a week later. It's brilliant - I fit everything except the two big notebooks into it. It fits in my bag with loads of room to spare and I know exactly where everything is now. If I want to change handbags, I just need to swap products around and move the whole thing into another bag. 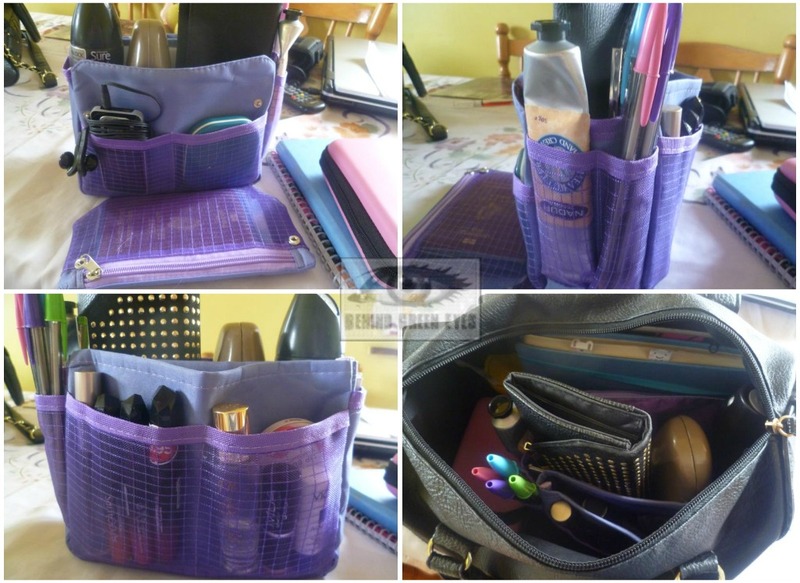 This organizer would also be really handy for tote bags or cotton shoppers that don't have pockets. I get really organized and then it all goes out the window a few weeks after! Oohh so tidy!! I'd be ashamed to show anyone the bottom of my handbags, they turn into an absolute state strewn with rogue tic tacs and receipts! O.o organized bag...I can't compute, lol. That organizer is pretty nice. I'll never keep it that way, I'm great at organizing & sorting stuff but it's keeping it neat that's the problem! Love that organiser, so handy. I tend to just use 1 handbag even though I have tonnes as I'm too lazy to switch everything around. This would make life easier and help me make more use of the rest of my collection. I'm exactly the same, but I've used 3 since I got this, so handy to pop into another bag!